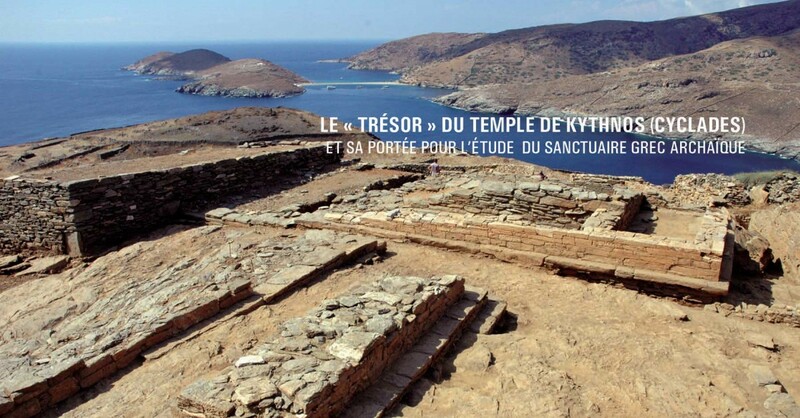 GRECE – Kythnos - In 2002 and thereon until 2006, on the site of the ancient capital of the Cycladic island of Kythnos, today called Vryokastro, the team of the University of Thessaly led by Professor Alexander Mazarakis Ainian, made an important discovery, the unplundered inner sanctum (“adyton”) of a temple, dated in the Archaic period. This back room was full with offerings in precious metals, mostly jewels, and a great variety of luxurious objects, dated mostly from the seventh to the early fifth centuries B.C., though certain objects date back to the Early Iron Age and there were also “antiques” dating to the Late Bronze Age. The finds in the “adyton” were perhaps re-positioned there during the Hellenistic period, following a damage of the temple by an earthquake. A second violent destruction some time later led to the final collapse of the edifice and the preservation of its contents up to the present day. The opulence of the finds both from within the temple as well as from the large votive deposit discovered nearby is impressive. The offerings, mostly jewels, were of gold, silver, bronze, bone and ivory, carnelian, rock crystal, glass paste, faience, amber, semi-precious stones etc. A number of imports from all over the Aegean World, as well as the East and West Mediterranean (Phoenician, Egyptian, South Italian) were also found. Among the finds there were significant numbers of terracotta seated female figurines. The pottery was broken though several vases were intact, coming from various production centres of the Aegean (the Cyclades, East Greece and Ionia, Corinth, Athens and Attica). Some of the Athenian black figure vases may be linked to master painters. Judging by the character of the finds and the architectural layout of the sanctuary (double sacred “oikos” and two altars standing on the side next to it) the cult may have been addressed to two divinities. Apollo and Artemis are likely candidates (this hypothesis is also supported by a few graffiti, which however are not conclusive). The study and publication which are well under way will contribute towards a better understanding of ancient Greek cult practices. The double temple with its two altars stood on a massive terrace which on its turn was bordered by a monumental terrace wall, more than 60 metres long. The latter may belong to the Hellenistic period and seems to mark the monumental reorganization of the entire upper plateau of the ancient city, allowing large-scale communal gatherings. It cannot be excluded that the Agora of the Kythnians was situated here. This idea is further strengthened by the discovery and excavation (from 2009 onwards) a few metres lower down the slope of a large public edifice dated in the late Classical and Hellenistic period. The architectural layout and the finds, which include votive offerings and official lead weights and measures of the Kythnians, suggest that the edifice may have been a Prytaneion. FRANCE – Saint Dizier - La troisième campagne de fouilles sur le site des Crassées débutera le 10 juin. Les archéologues fouilleront la nécropole mérovingienne jusqu'au 29 juin et la villa gallo-romaine jusqu'au 5 juillet. Les deux archéologues de l'Inrap qui encadrent ces fouilles ont établi un programme de recherche afin de lever le mystère sur les sépultures découvertes en 2002, des secteurs encore inconnus vont en effet être fouillés. Ils seront accompagnés de fouilleurs bénevoles, dont plusieurs bragards, pour étudier les profondeurs de Saint-Dizier. Cette nouvelle campagne de recherches archéologiques est menée dans le cadre d'une convention signée entre la Ville de Saint-Dizier et l'Inrap, pour continuer, selon une périodicité régulière et programmée, la fouille du site des Crassées. Il s'agit de fouilles programmées ; ce programme spécifique rassemble archéologues professionnels et bénévoles pour qeulques semaines, en été. Concernant la nécropole, l'équipe va poursuivre ses investigations. Les fouilles de 2012 ont permis de compléter son plan. Cette année, « nous essayerons de comprendre l'agencement des tombes, notamment leur relation avec un nouveau type de structure, un empierrement » annonce l'archéologue et anthropologue Stéphanie Desbrosse-Degobertière. Concernant la villa gallo-romaine, les découvertes de 2012 ont livré les plans des différentes salles : termes, vestiaire ou encore sas thermique. Raphael Durost, l'archéologue en charge de la villa déclare : « nous voulons trouver le reste du batiment, au milieu devait se trouver une salle de réception destinée à recevoir les invités, et à l'autre extrémité les appartements du propriétaire. Le tout doit être accolé à une galerie de façade, que l'on retrouve déjà contre les thermes, et qui donne sur le jardin ». Cette campagne permettra d'en apprendre davantage sur ce site exceptionnel mais aussi sur l'histoire de la Ville de Saint-Dizier. RUSSIE – Océan arctique - Russian scientists claimed Wednesday they have discovered blood in the carcass of a woolly mammoth, adding that the rare find could boost their chances of cloning the prehistoric animal. An expedition led by Russian scientists earlier this month uncovered the well-preserved carcass of a female mammoth on a remote island in the Arctic Ocean. Semyon Grigoryev, the head of the expedition, said the animal died at the age of around 60 some 10,000 to 15,000 years ago, and that it was the first time that an old female had been found. But what was more surprising was that the carcass was so well preserved that it still had blood and muscle tissue. MEXIQUE – Sierra del Mayor - Archaeologists discovered eight temporary camps in the Sierra del Mayor mountains, in the Mexican state of Baja California, that date from 400 to 7,000 years ago, the National Anthropology and History Institute, or INAH, said. In the camps associated with the Cocopah culture were found hundreds of animal bones, some from extinct species, ceramics, stoneware, and places where iron oxide was mined to make pigment for murals and body painting. The discovery took place in the rocky recesses of the Sierra del Mayor south of Mexicali, capital of Baja California, after three years of explorations with the collaboration of the Cocopah Indians. Some of the camps were occupied by people the researchers call "indigenous archaeological Cocopahs," who lived between 400 and 2,000 years ago, while others from about 7,000 years ago belonged to nomadic groups that preceded the Cocopah, the INAH said. Further sites exist in other parts of the Baja California peninsula, but this is the first to be discovered in Cocopah territory on the Sierra del Mayor, the INAH said. 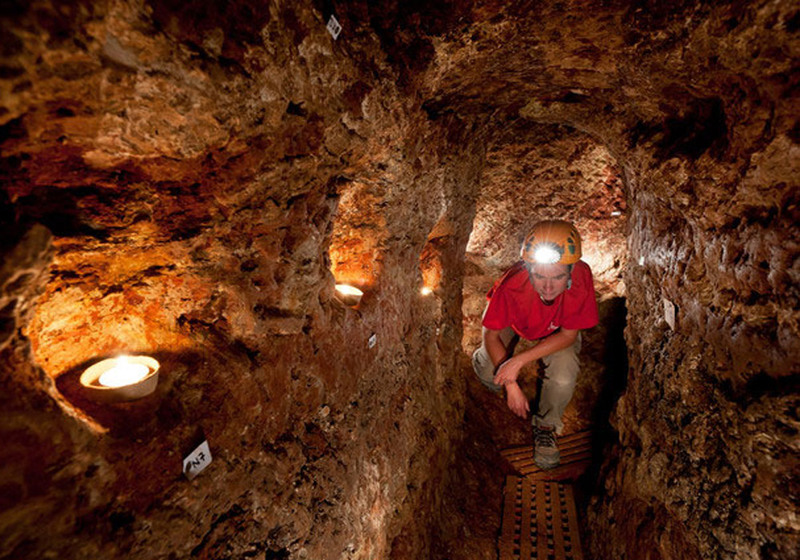 FRANCE – Bléré-Val-de-Cher - A well preserved underground refuge chamber which was likely connected with a dynastic clash involving local medieval aristocrats was brought to light in Bléré-Val-de-Cher, in central France. The archaeologists excavating an area where an artisan centre is to be built, found the refuge consisting of a network of several hallways and rooms extending along more than fifteen linear metres. The site is entered by a staircase dug into the ground, and its interior contains rather elaborate modifications including twenty niches to hold old lamps, benches carved into the limestone, a small well, fed by the groundwater table and boards to level the ground surface. All of these elements suggest that it could accommodate five or six persons for a prolonged period, possibly a small family unit. The entrance was closed off by a door at the bottom of the staircase, and another protected the access to the three hallways. The chamber could also have been used to store and protect food from looters. The discovery of a ceramic cooking pot in the infill of the underground chamber allows it to be dated to the end of the 11th century. At this time, the Counts of Anjou and Blois were quarrelling over the possession of the Touraine region, where there was a large network of military installations. 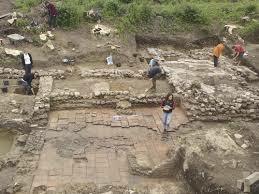 What really happened is to be determined through an extensive survey of the finds by specialists.